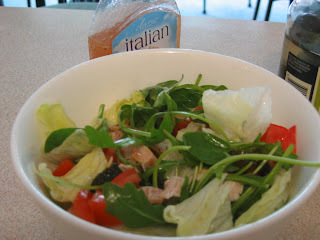 This is very refreshing and simple salad, that i made today for my lunch with my left over grilled chicken from last night, try and please comment this recipe. Combine the salad leaves and baby rocket, and arrange on a bowl. Top with the tomatoes, gherkins and chicken pieces. 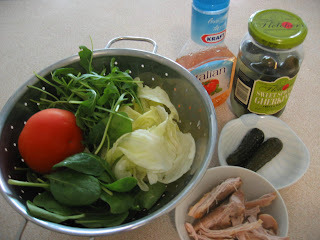 To make dressing, whisk gherkins juice and italian dressing together, pour over the salad and serve.